Joe Root hopes "a century is written in the stars" for Alastair Cook as England try to send their record run-scorer out on a high by beating India in the fifth Test at The Oval. Friday's match will be Cook's last before his international retirement, although the 33-year-old left-handed opener will continue to play for Essex. 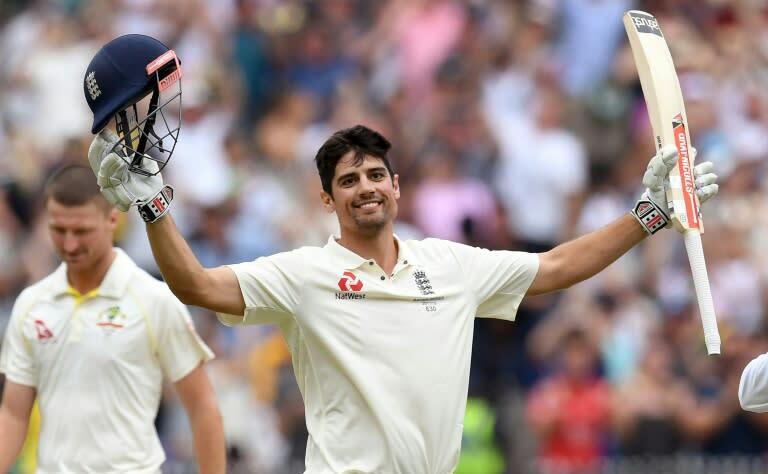 Cook announced he was calling time on his England career on Monday, following a 60-run win over India in the fourth Test at Southampton that gave England an unbeatable 3-1 lead in the five-match series. He may have scored 12,254 Test runs and appeared in a world record 158 consecutive matches at this level, but former England captain Cook is averaging a meagre 18.62 from nine Tests this year. But Root, his successor as England skipper, believes Cook could yet finish his career as he started it -- with a century. Essex opener Cook scored 104 not out on his Test debut, against India at Nagpur in 2006, the first of his England record 32 hundreds. "Now it's about us as a team giving him an opportunity to go out in the best way possible," Root told reporters at The Oval on Thursday. "That means going out and making sure we win this game. It's an extra incentive for us as a group and would be a fitting way to finish what would be a fabulous career." Cook hasn't reached three figures in Test cricket since a marathon 244 against Australia in Melbourne in December. But Root insisted: "I have seen one coming for a while (a century) though you might not think it with the scores he has had in the last couple of weeks. "It would be nice to start and finish with a century. You never know, it might be written in the stars," the Yorkshire top-order batsman added. India vice-captain and middle-order batsman Ajinkya Rahane paid tribute on behalf of Cook's final Test opponents by saying: "He has been fantastic for England cricket. "Credit to him, the way he has handled his batting, his technique and all the pressure from you guys (the media)." Meanwhile, Root said Cook's decision had taken him aback but that there was no point in trying to change his mind. "I was a little bit surprised. But he was adamant in his decision. You could see in his face that was what he wanted and he'd obviously thought it through and was ready for that. "When you get that impression from someone there was no point in me trying to talk him round." Reflecting on Cook's overall contribution to England, Root said: "It's been an outstanding career; 12 years at the top of the order –- to have a record like that is some feat, especially in these (English) conditions for the majority of it. There's not many openers around the world who can match that, never mind English players. So he's going to be very hard to replace." Asked what Cook had meant to his own career Root, replied: "He's been a huge influence on me. First he gave me the opportunity to play. As a role model, there aren't many people who go about things in a better way than he does. He's very down to earth. "Jos (Buttler) summed it up. He's the most down to earth superstar you'll ever see. He's always got time for everyone. That's a great quality to have in any walk of life, never mind a high-pressure environment like international cricket. "I'll miss him being around. Not just for his runs and what he adds to the team but as a person as well."